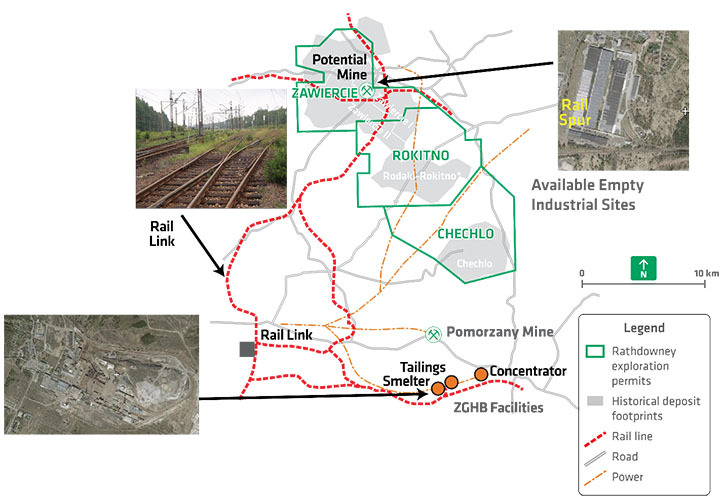 Rathdowney Resources Ltd. (TSXV: RTH) is a Canadian company whose primary focus is developing and permitting its flagship, 100%-owned Olza zinc-lead-silver development project in Poland. Rathdowney is committed to creating value for its shareholders and advancing Olza by having invested +C$25M into exploration and development activities. 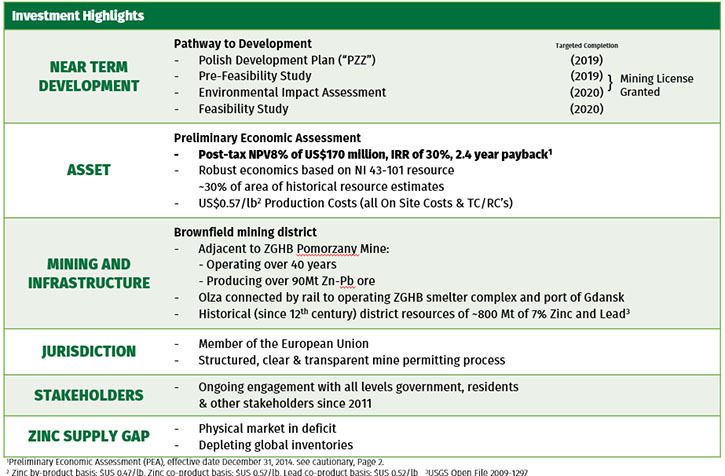 We learned from Roger Blair, Vice President of investor relations for Rathdowney Resources, that project Olza has an inferred resource of 24.4 Mt @7.02% Zn-Pb. They have been in the formal permitting process for one year with the goal of attaining a mining license by 2020. According to Mr. Blair, 2018 will be a very proactive year for Rathdowney. Dr. Allen Alper:	This is Dr. Allen Alper, Editor-in-Chief of Metals News, interviewing Roger Blair, Vice President of Investor Relations for Rathdowney Resources. Could you give our readers/investors an overview of your company, your focus and current activities? Mr. Roger Blair:	Yes. Thank you very much for interviewing me, Dr. Alper. It is a pleasure to speak with you. Rathdowney Resources is a zinc, lead and silver development company, affiliated with the Hunter Dickinson Group. Our primary focus is to develop and permit the Olza project, which is located in Poland. From the 1950's to 1980's, the Polish State Geological Survey carried out studies in the area of Project Olza, obtaining extensive geological information by means of diamond drilling. The results of this work indicated the presence of significant zinc-lead mineral deposits, with a historical estimate of 77Mt @ 6.15% Zn+Pb. Several historical estimates of resources were completed under a Soviet-era classification system. From mid-2011 to early 2013, Rathdowney completed a successful campaign of confirmatory drilling focused along a trend on the Zawiercie and Rokitno concessions. The current inferred mineral resource of 24.4 million tonnes grading 7.02% Zn+Pb, which is based on both Rathdowney and historical drilling, including additional historical data received to July 2014. Dr. Allen Alper:	That's a great resource. What are your plans for 2018? Mr. Roger Blair:	We currently are working on our environmental impact assessment and our Polish development plan, in parallel. Once we successfully deliver these milestones we will be granted a mining license. We have been in the permitting process for one year but have collected data for 3 years. Our focus is to complete detailed data collection and compilation zoning for our Environmental Impact Assessment. We are engaged in engineering data collection for our development plan, with refinement of design and costing for our Polish Development Plan. We are also continuing comprehensive stakeholder engagement. Dr. Allen Alper:	That sounds good. Dr. Allen Alper:	Could you tell us a bit about your management team, and also your background? Mr. Roger Blair:	We have a fantastic management team. Robert Konski, our President, CEO and Director is a Polish national. Robert has over 25 years of experience as a strategic advisor to management of public and private companies. He has overseen energy and infrastructure projects, financial services, as well as our restructuring activities. David Copeland, our Chairman and Director, is a professional engineer and mining executive with almost 40 years of experience in advancing mineral projects. Mr. Copeland is also a director of Hunter Dickinson. We also have a very talented technical team in Poland. Barbara Chammas is a senior Environment and Community Relations manager. We have two geological zinc specialists and a senior General Manager. I began my Investor Relations career in 1998 and led corporate communications campaigns and initiatives for junior and mid-tier mining companies inter-listed on the TSX and American stock exchanges. I have been working with Rathdowney and the HDI team since 2011. Dr. Allen Alper:	That's great! Could you tell our readers/investors why you think your project is of interest and important? Mr. Roger Blair:	Project Olza has long life potential, low cost production, in an established mining district that is properly regulated, with a team that has a successful track record of developing and de-risking mining projects. Dr. Allen Alper:	That sounds great. Could you tell us a bit more about your capital structure and your share structure? 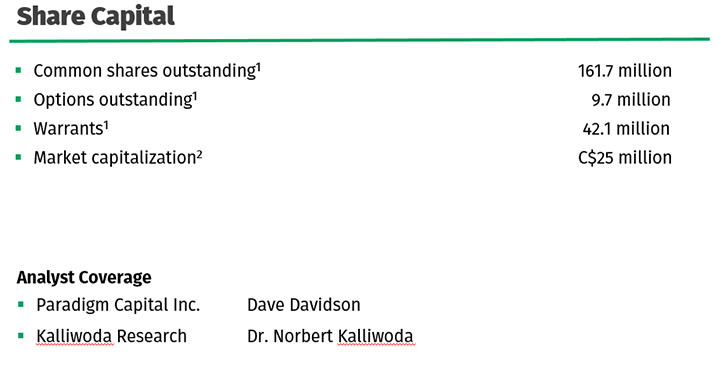 Mr. Roger Blair:	Please see our Share Capital structure below. Back in March of 2017, we raised $6.9 million Canadian and we fully funded to complete our 2018 milestones. Dr. Allen Alper:	That sounds very good. What are the primary reasons our high-net-worth readers/investors should consider investing in Rathdowney? Mr. Roger Blair:	RTH enjoys robust economics and low production costs based on NI43-101 resource of 24.4 Mt which is only 30% of our historical resource. We have three billion pounds of zinc and 800 million pounds of lead with a silver kicker. Olza is a long life project with 20 years of drilled resources. Our production costs are US$0.57/lb. We are adjacent to the ZGHB Pomorzany Mine which has been operating for over 40 years and producing over 90Mt Zinc and Lead. Olza is connected by rail to the operating ZGHB smelter complex. We have all the necessary infrastructure: power, rail, water, roads, and skilled labour available to us at site. We have enjoyed fantastic stakeholder relations since 2010. Poland is a progressive, well-established, law-abiding country with reasonable tax rates. It has a GDP growth rate of 3.1% and reasonable resource development legislations. I think the fact that our low market cap does not reflect our true value, makes for a great entry point. 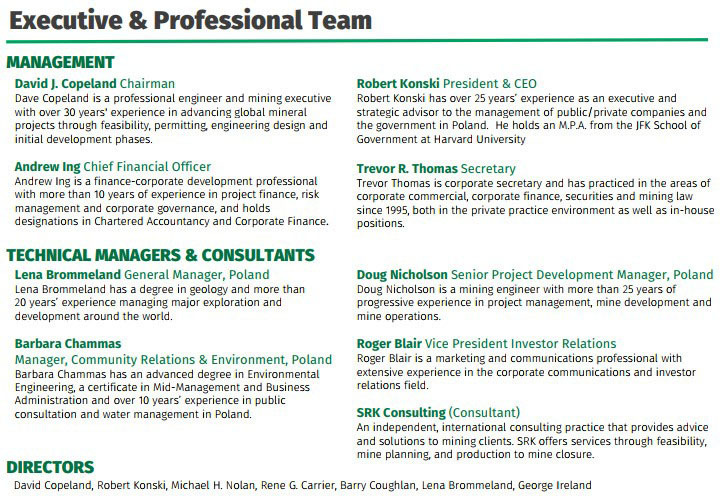 Dr. Allen Alper:	Sounds like very fundamental reasons why our high-net-worth readers/investors should consider investing in Rathdowney Resources Ltd.
Mr. Roger Blair:	Rathdowney is affiliated with the Hunter Dickinson Group. The HDI successful track record spans over 30 years, 19 public and private companies, dozens of mineral properties on six continents, leading to the development and operation of eight mines. Along the way, HDI has generated significant value for its public company shareholders - far in excess of industry peers and benchmark indices. Dr. Allen Alper:	That sounds excellent.